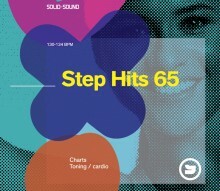 Packed with all the latest music in the charts, Step Hits 65 is bound to get your class motivated and moving. We have even found wicked dance mixes for the slower tunes which we love and which would not normally be step speed. Step Hits 65 features artists such as, Jason Derulo, Bruno Mars, Katy Perry, David Guetta, Justin Beiber, Ed Sheeran, Clean Bandit, Lady Gaga, Liam Payne, Shawn Mendes and many more. Order your copy today and give yourself and your classes some fresh inspiration. Teaching tip: As the BPM gradually rises you can teach your more complex choreography at the beginning of the class where the speed of the movement is slower, giving your class more time. Also if you are teaching a Body Conditioning class then you can do your larger, deeper movements at the start of class, after your warm up of course. Click the button below to add the Step Hits 65 to your wish list.